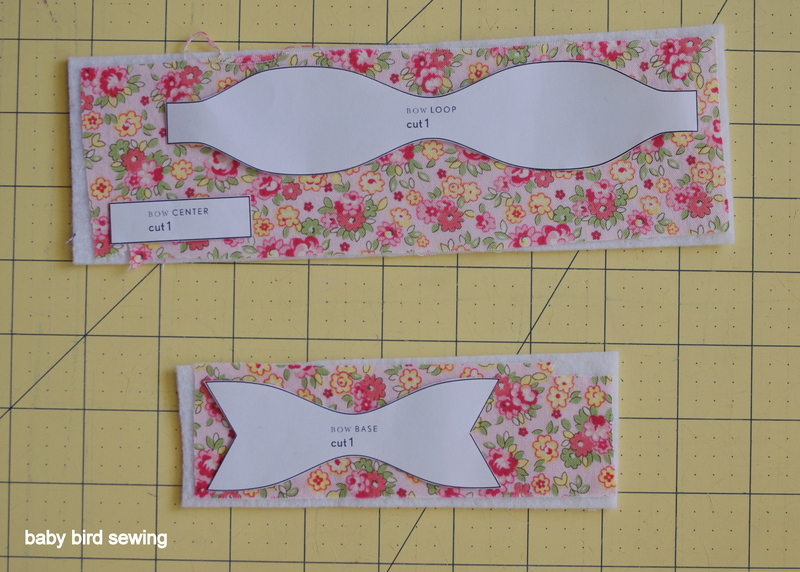 First, download and print the Oliver + S bow pattern. I printed the two sizes that were mentioned in the tutorial, 100% and 60%. 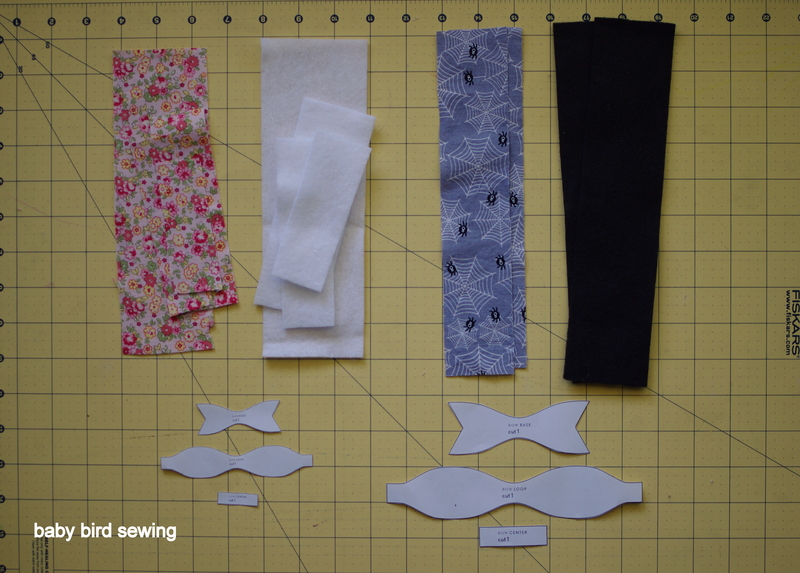 Once you have your pattern cut out, find some felt and fabric scraps that are slightly larger than the pattern pieces. 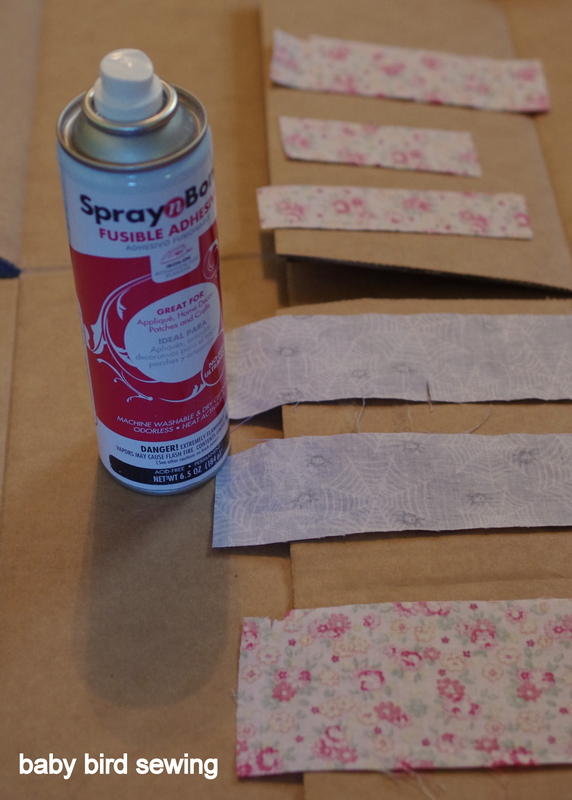 Spray the WRONG side of your fabric scraps following the directions on the spray can. If you are using fusible heat ‘n bond, same thing. Apply it to the WRONG side of your scraps following the directions on the packaging. If you are using spray ‘n bond, be very careful and protect the surrounding area. 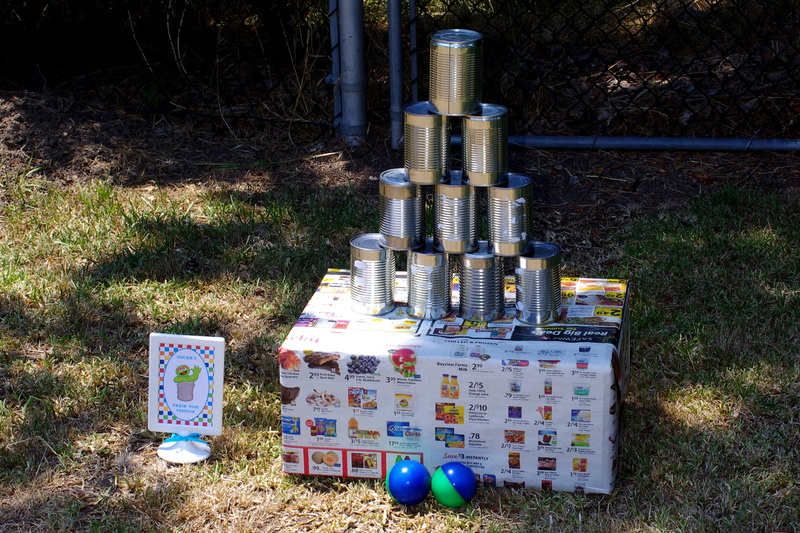 I did it in the garage and placed the scraps on some broken down cardboard boxes. Glad I didn’t attempt this in the house! This was my first time using spray ‘n bond and it sprays much stronger and faster than I anticipated. I wasn’t sure how much to spray. I think I’ll have to experiment a little with this. And honestly, I think for this project the fusible kind might be better and provide a stronger bond. This is what the back side of my fabric looked like after I sprayed it and let it sit for a few minutes. It has a slightly textured look and feel. 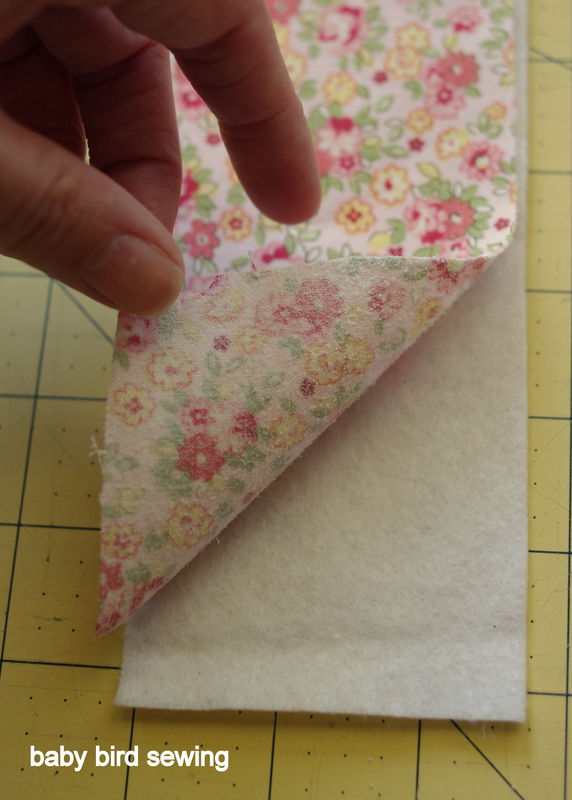 Once it’s dry, which is pretty immediate, place the fabric scrap WRONG side down onto your felt scrap. 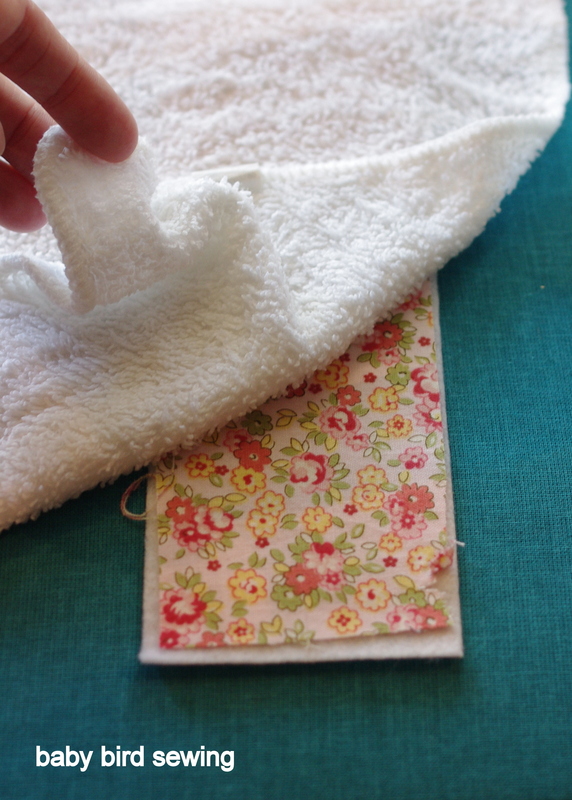 Use a press cloth to adhere the fabric scrap to the felt scrap following the directions on the spray ‘n bond can or the heat ‘n bond packaging. Once your fabric scraps are bonded to your felt scraps, use tailor’s chalk or a fabric pen (…or a ball point pen) to trace the pattern. If you plan to wrap the bow center around a headband or a clippie, you may want to make that piece slightly longer than the pattern to give yourself some leeway. You can always cut it shorter later on. 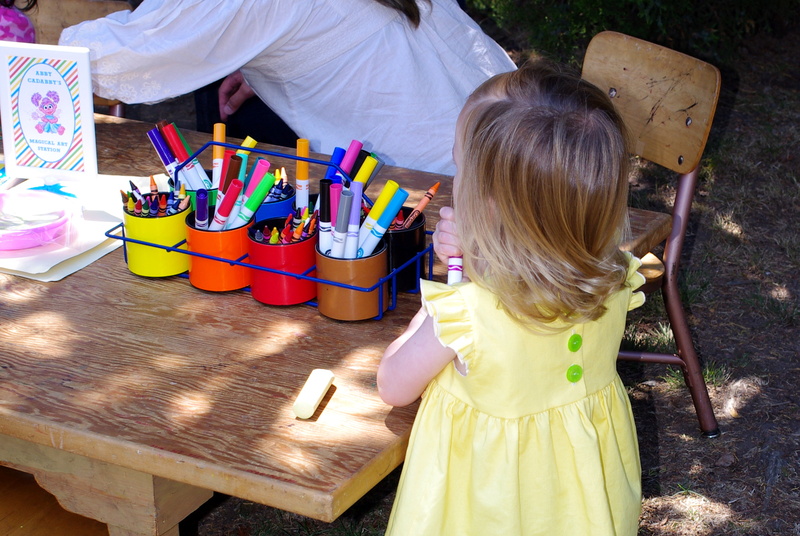 Cut out your pieces…making sure to trim off any pen markings from tracing if you used a ball point pen. 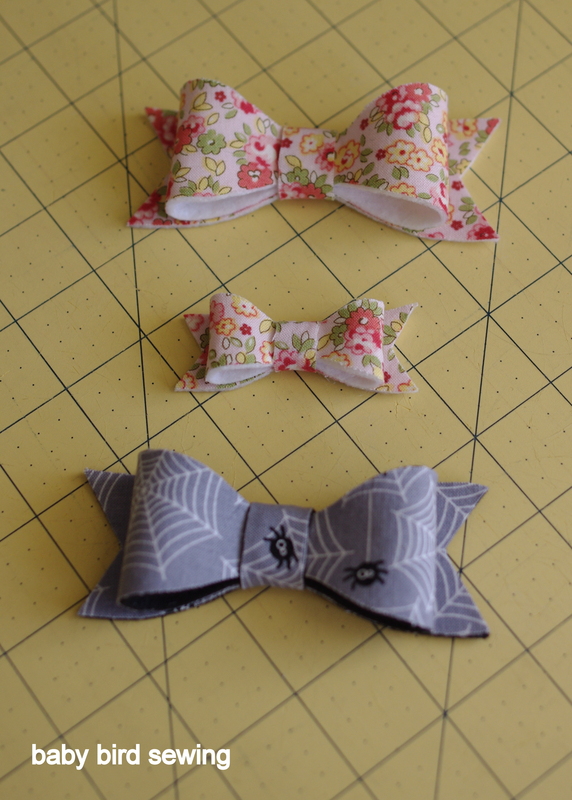 Once you have your pieces, follow the Oliver + S tutorial to assemble your bow. 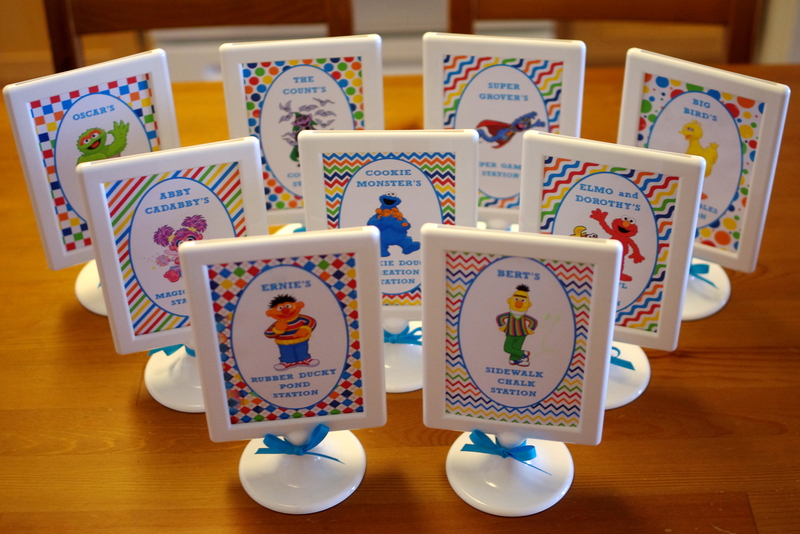 Attach to a headband or a clippie and enjoy! 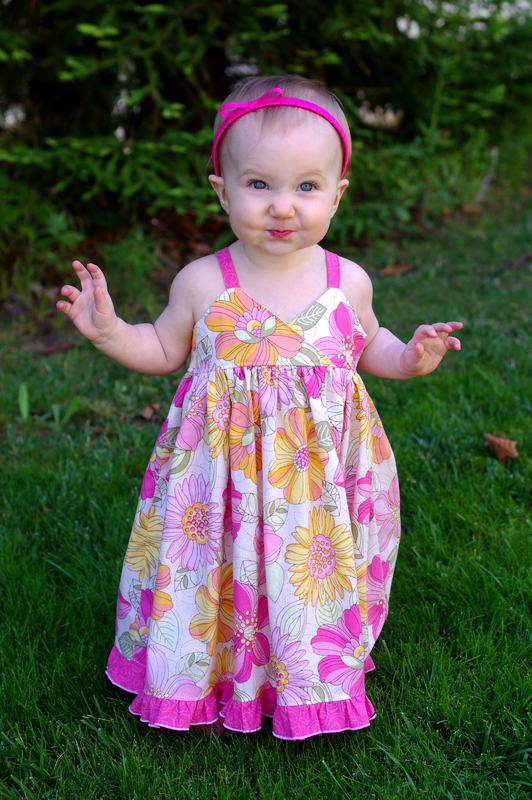 An adorable pattern, and even more adorable with your favorite fabric scraps! I finally finished decorating our front porch, and I love it! I started out with the grapevine and felt flower wreath, which you can read about here, and then went from there. The doormat is from Bed Bath & Beyond. 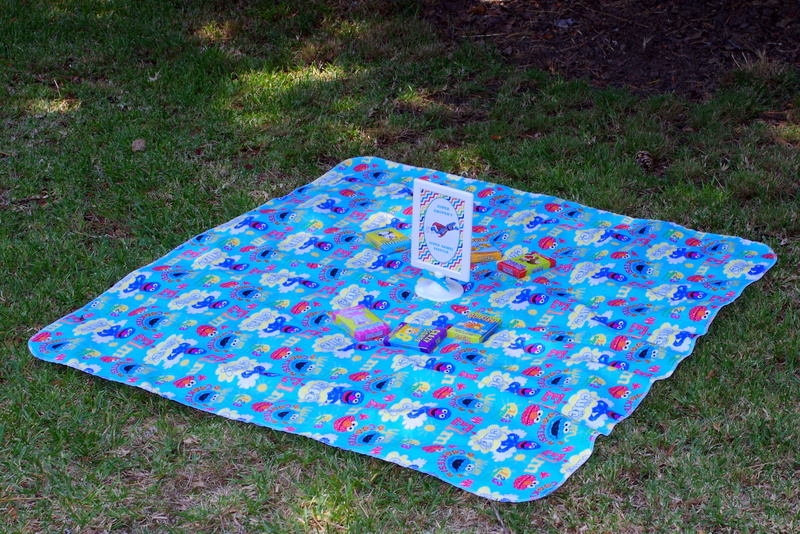 Doesn’t seem to be on their website… I love that it will work for the entire fall season. 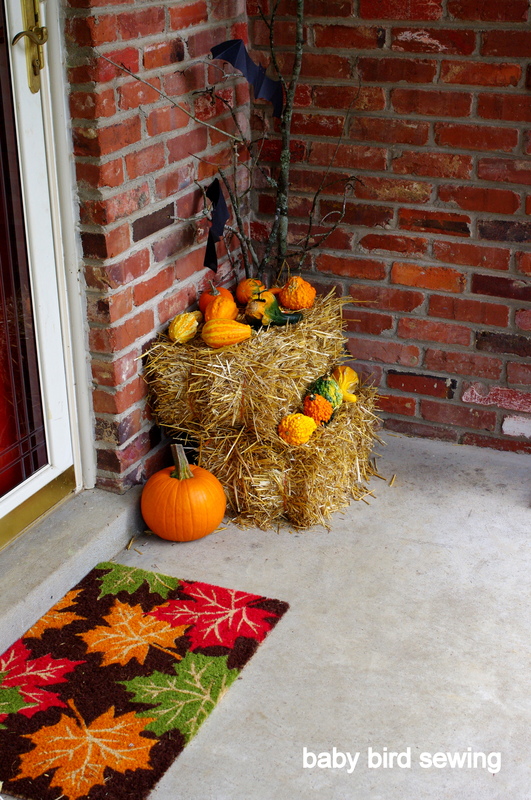 The hay bales, the mums, and the mini gourds are all from Home Depot. I bought four small hay bales, placed two on each side, stacked one on top of the other with the bottom hay bale a little bit pushed forward away from the house and the top one resting against the house to create a stair step. Then I scattered the mini gourds over the tops. The gourds are constantly getting rearranged. My girls love to switch them around and to take them all off and pile them up on the top of the porch steps until I insist that they be put back. Katie loves to run around when I’m not looking with random bumpy ones saying “favorite” trying to bite the bumps off until I catch her and convince her that it’s yucky and that she should stop. 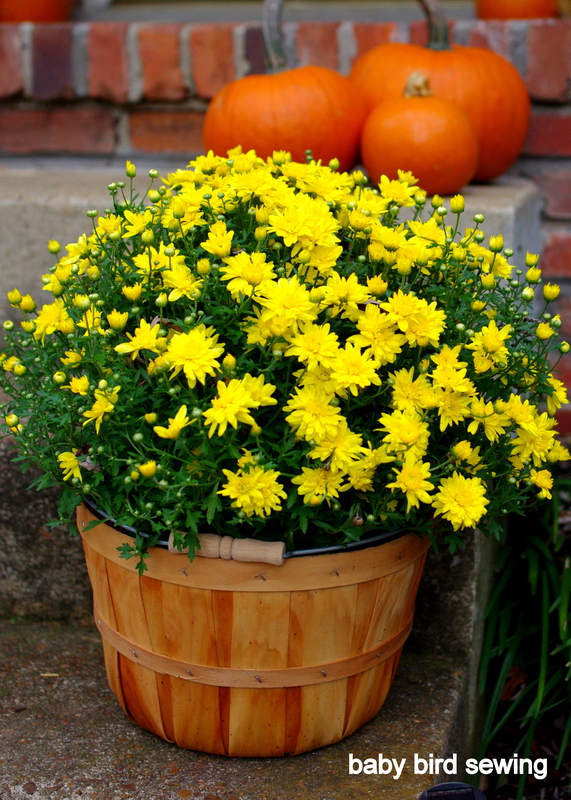 The mums are still in the pots that they came in, which I then put into inexpensive baskets from Michael’s to dress them up a little. 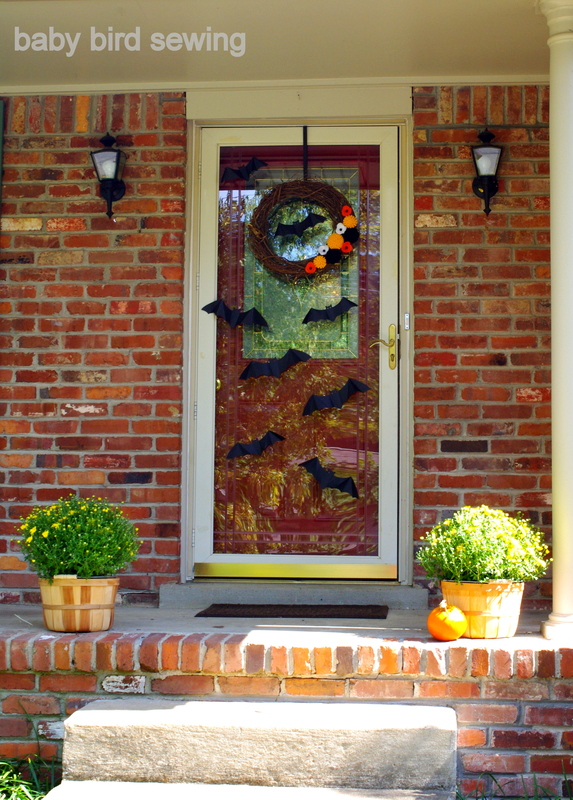 The Martha Stewart dimensional silhouette bats were originally on the door, as you can see here. I used the glue dots included in the package but they didn’t survive the afternoon. I then used a little bit of hot glue on the dots thinking that might do the trick. Sadly, no. I wasn’t sure what to do with the bats until a few days later when we had a thunderstorm and a bunch of smallish branches fell from our two large trees in the front yard. While gathering them to put with our yard waste, I realized that they would be perfect for the bats and FREE. A little hot glue and done. No falling off this time. I was originally sad that the bats didn’t stick to the door because I really loved the way that looked, but I think they look way better on the branches! 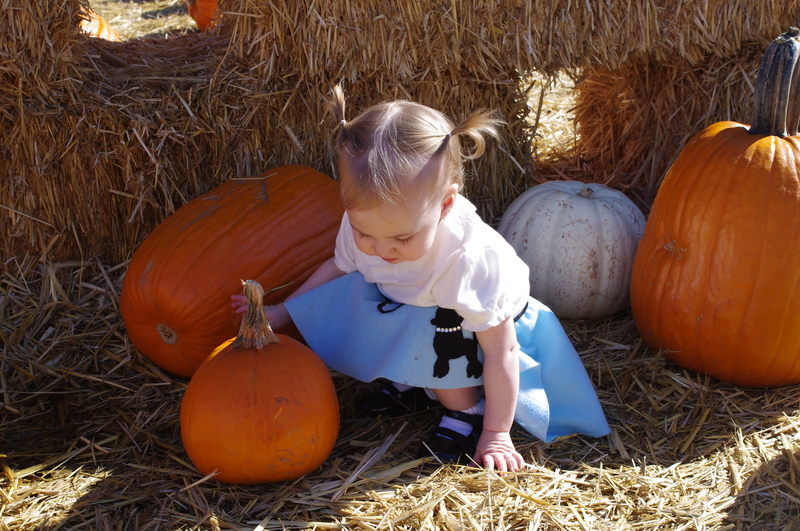 And the final addition were the pumpkins. A $20 score from our church’s first annual pumpkin patch. Hannah picked them all out except for one. They aren’t really carving size. We might just do stickers at some point and call it good. They’ll last longer that way anyway. Halloween is coming! 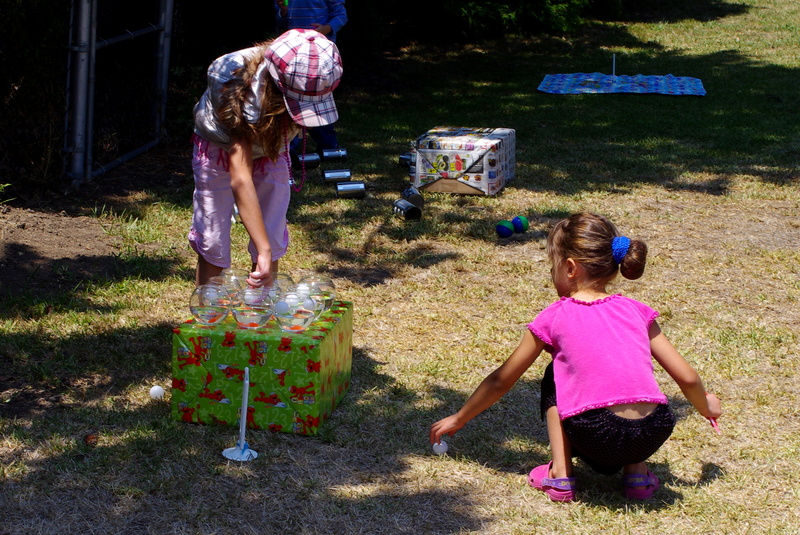 A very exciting time for little ones. 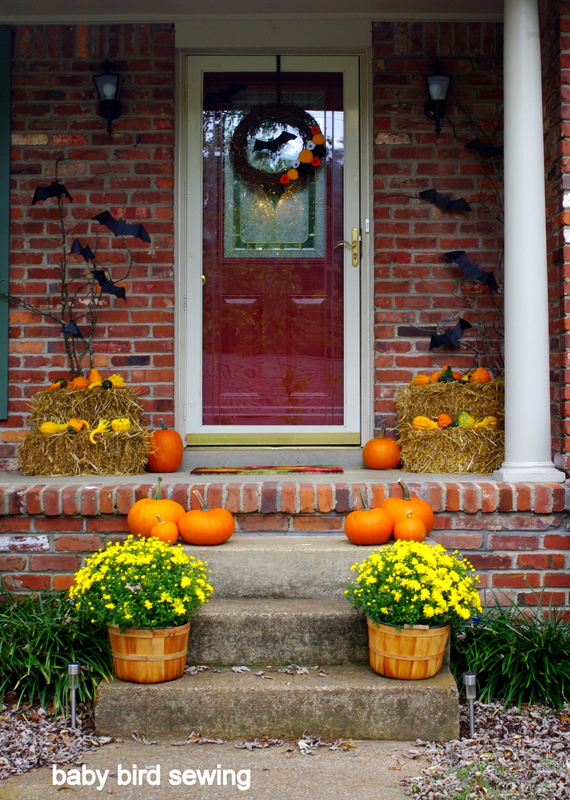 Since this is our first Halloween in a house, I really want to go all out with front porch decorations. 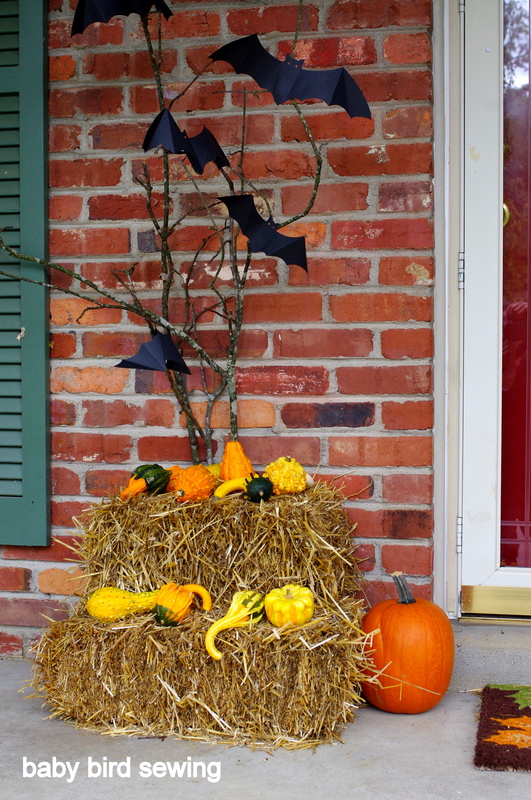 For Halloween porch decor, I decided to start with a wreath (…a couple of mums, a free mini pumpkin, Martha Stewart dimensional silhouette bats…) and then go from there. I bought a grapevine wreath from Micheal’s and then used this tutorial from the Crafted Sparrow to make felt flowers. 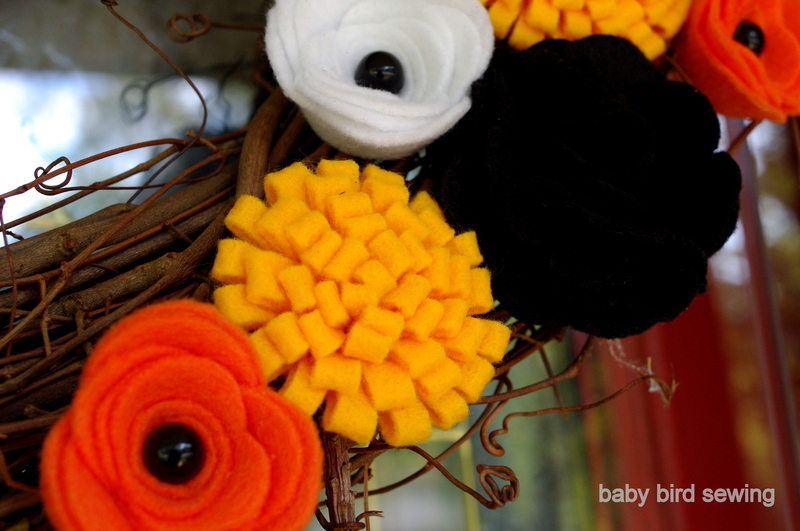 I made the looped mum flower in a yellowy orange, the rolled rose in orange and white, and the scalloped frosting flower in black. For the roses, I glued little black buttons in the centers. 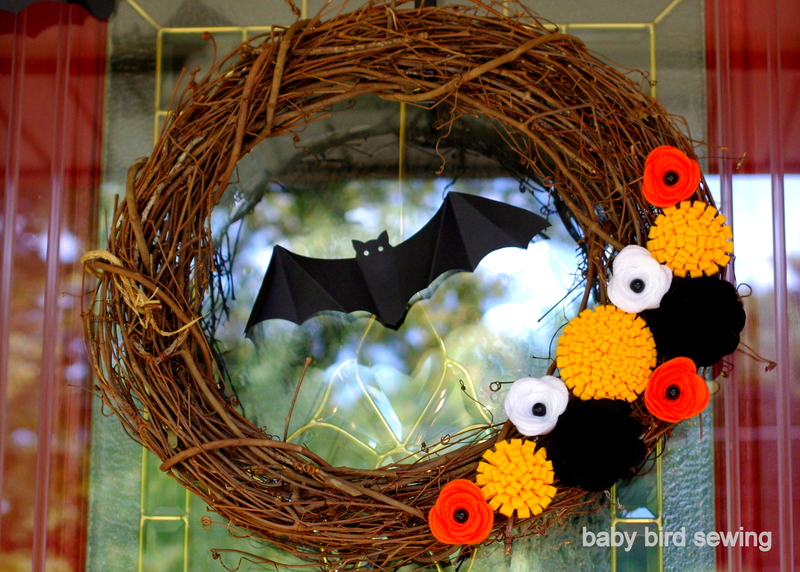 It looked great without the buttons but it gave the wreath more of a Halloween look with the added black. To attach the flowers to the wreath, I simply glue gunned them. Easy and done! 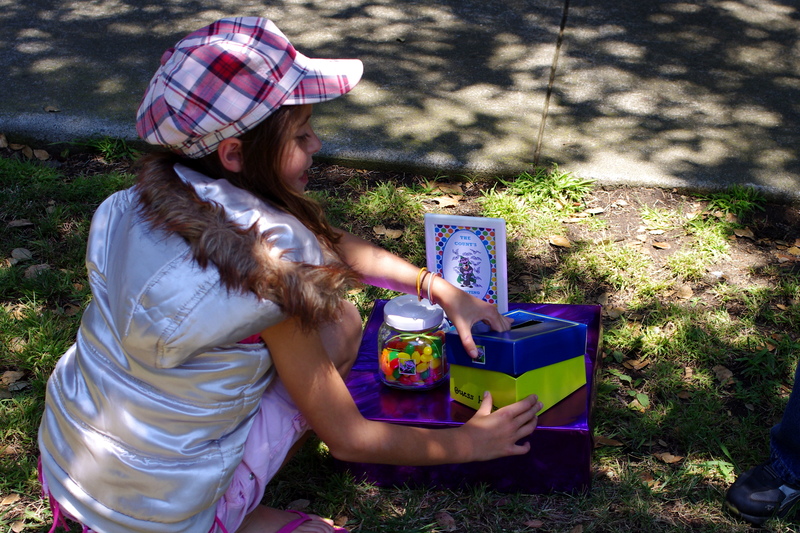 One of the great things about this project was that it was really inexpensive. I only had to buy the wreath and the hanger, which were around $7 total. Everything else I had on hand. And since I recently found out that Michael’s will take competitor coupons, I was able to use my Joann’s coupon for 15% off my total purchase, which brought the price down a little bit more. So…it’s been a very long time since I last posted. But I have very good reason to be neglectful. We are expecting our second child in March! 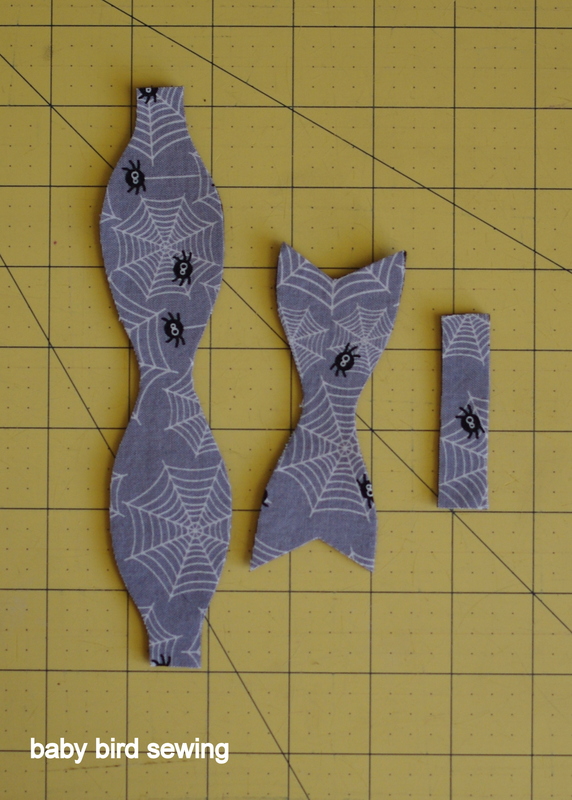 I have been so so tired that I can barely manage any sewing, but with Halloween upon us, I luckily got a little bit of energy and inspiration. When Hannah and I were perusing at Joann’s recently, we were looking at Halloween prints and Hannah absolutely fell in love with this purple Halloween kitties print. Since she was smiling and hugging the bolt of fabric, I figured I might as well whip up a little Halloween skirt for her. She’s actually worn it quite a few times since I made it a couple of weeks ago and seems pleased as can be every time she wears it. 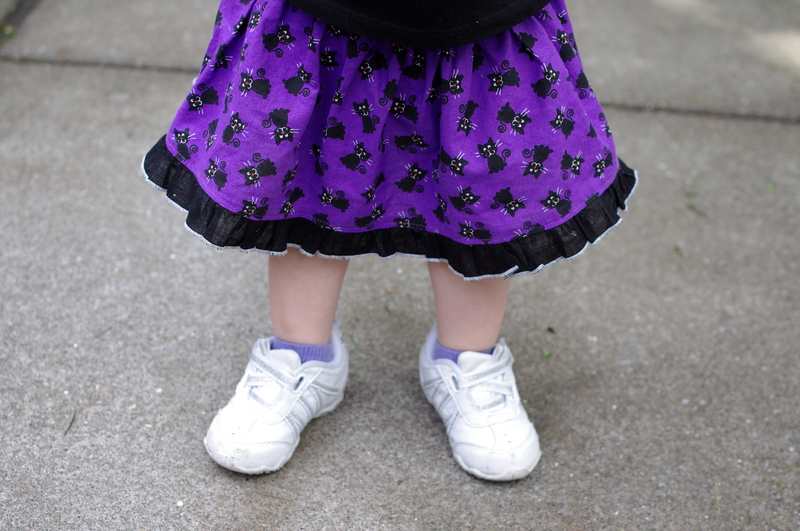 It’s just a simple elastic waistband skirt with a rolled hem ruffle. 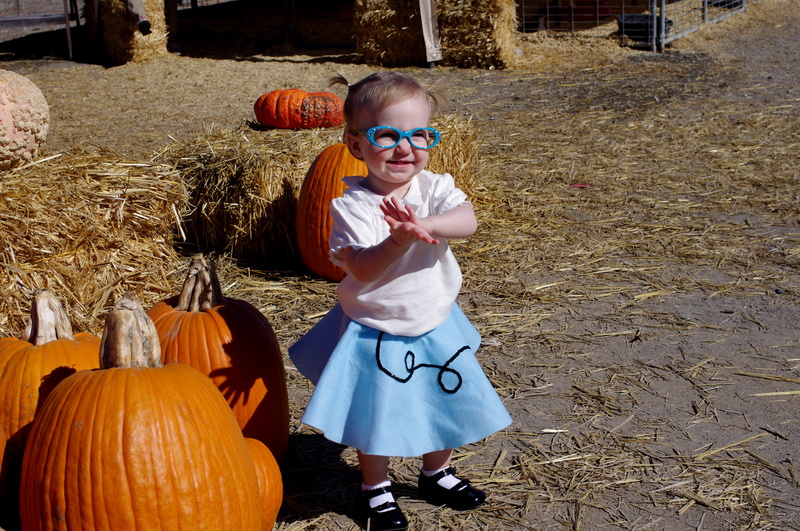 The most important Halloween item is obviously the costume! This year was my turn to pick since last year my husband picked (so glad that we’ve moved beyond the receding hairline of last year, lol!). I decided on a poodle skirt getup, which is one of my all time favorite costumes. I’ve been dragging my feet on finally making it, having trouble deciding on a poodle silhouette, until my husband, in a very sweet way, finally told me to go with the one I had already cut out and be done with it. Thankfully I followed his advice or I’d be having a panic attack today still trying to decide! 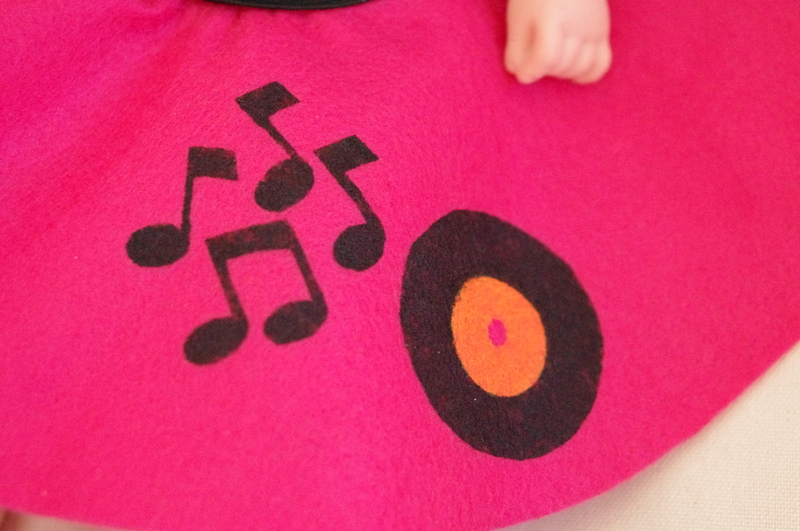 I used Dana’s tutorial on Made to make a simple felt circle skirt (before attaching the elastic waistband, I put all of my embellishments on the skirt). I laid out my string of sequins, used a fabric marker to trace my layout for a guide while sewing, pinned in a few places, and then sewed the sequins on. Not as hard as you’d think! Finally, I fused the poodle onto the skirt and then glue gunned some rhinestones onto it for a collar. 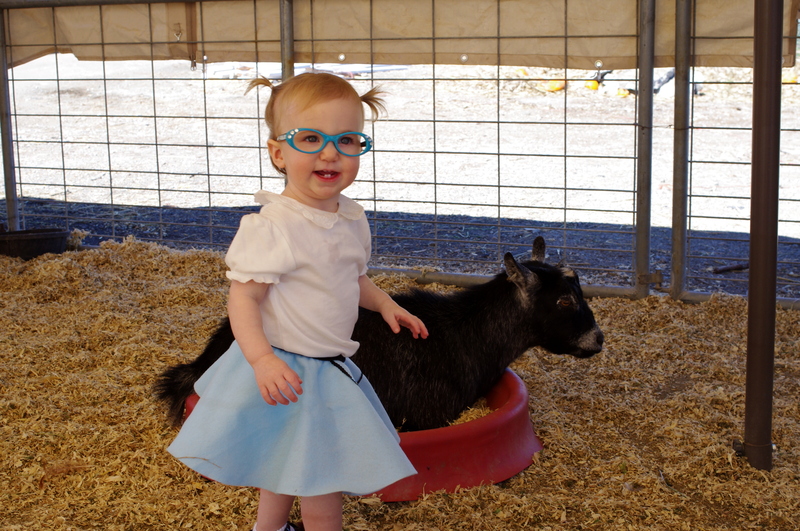 For the glasses (which she wore for only a little while), I used some dollar toddler sunglasses from Target. I simply popped out the lenses and glue gunned three rhinestones onto each side. Gluing the rhinestones was actually the hardest part of the whole costume! They are so tiny and hard to handle while working with hot glue! The onesie and shoes were awesome thrift store finds! I wasn’t sure what I’d find at the Goodwill up the street. It’s new and pretty small. I’ve never found anything good there before the few times I’ve popped in for a look, but this time I hit the jackpot! Originally I was really hoping to find a top with a peter pan collar for that classic, old fashioned look but I didn’t think I would be able to, so I was willing to settle for a plain white onesie from the closet…until I stumbled across this adorable and brand new, tags still on onesie. It’s a little big but works perfectly for her costume and she’ll have time to grow into it for future use. The shoes are practically brand new and for $3.99, you can’t beat it. I’m thinking they’ll get some use this holiday season as well. And there you have it, a very easy and quick costume. Just the kind of thing this pregnant mommy needed! 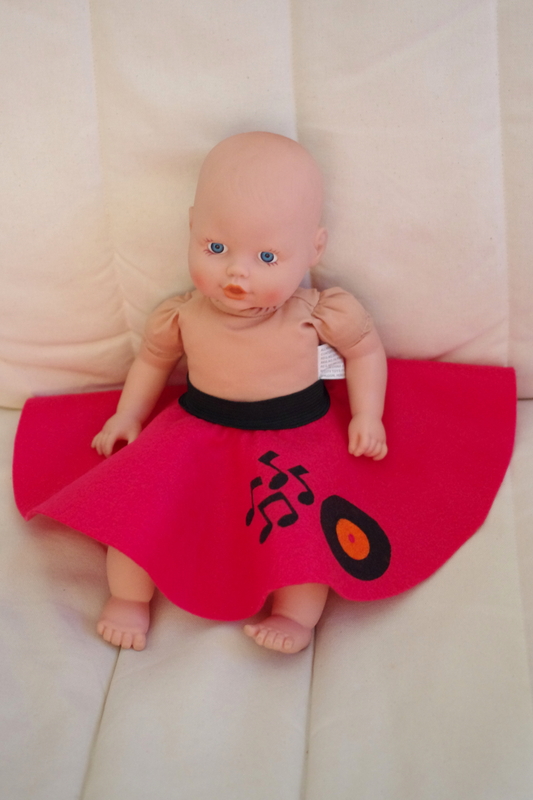 Taking a break from Christmas sewing, which I promise to share soon, I sewed up some quick circle skirts for Hannah’s baby doll. I used a fat quarter from my fabric stash and a scrap piece of elastic and in something like 30 minutes, I had a new circle skirt! I used this tutorial from the amazing blog, Made. 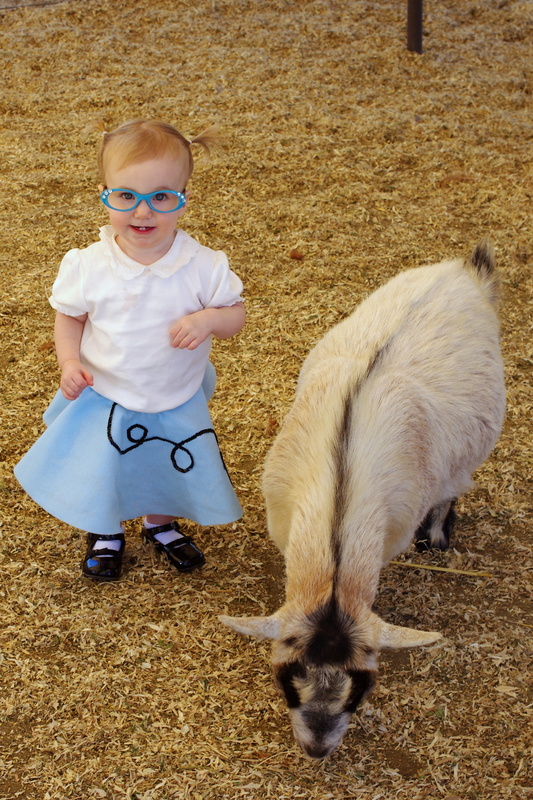 This quickie project was actually a test run for Hannah’s Halloween costume. Last year she was Wonder Woman and this year she is going to be a 50’s girl. I absolutely adore poodle skirts! My mom made one for me to wear to my elementary sockhop dance and I’ve been in love ever since. Instead of cutting out and sewing on appliques (which I’ll do for Hannah’s skirt), I traced clipart images from Microsoft Word onto some cheap wrapping paper, cut it into a stencil, ironed it onto the skirt, and painted my design. So much easier than fiddling around with such small appliques! I’m going to touch up the black with a sharpie where it needs it. 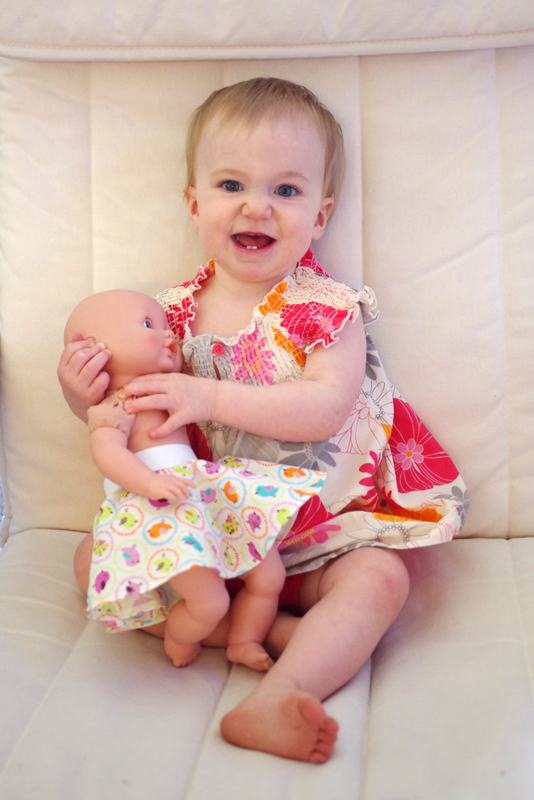 Now I just need to get started on Hannah’s outfit…oh yeah, and baby needs a shirt!!! 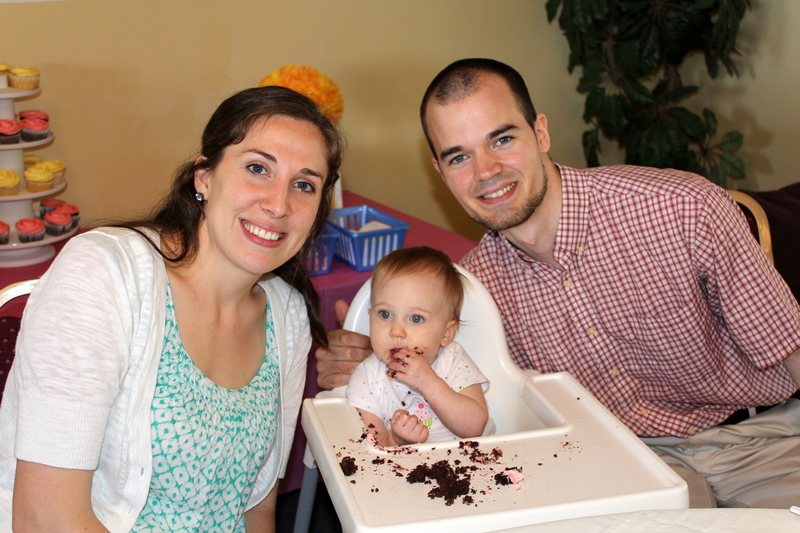 This past Sunday we celebrated Hannah’s first birthday. 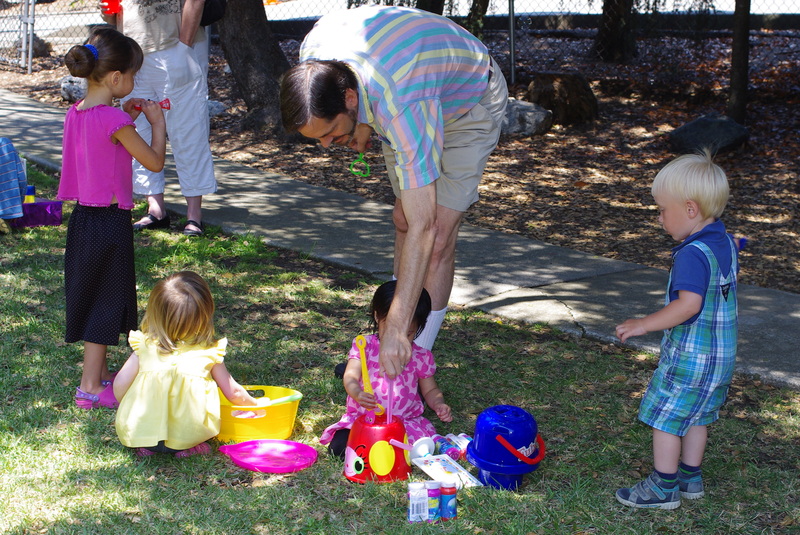 Her actual birthday is this Sunday, but I thought it would be fun to coordinate Hannah’s birthday party with our July potluck at church. 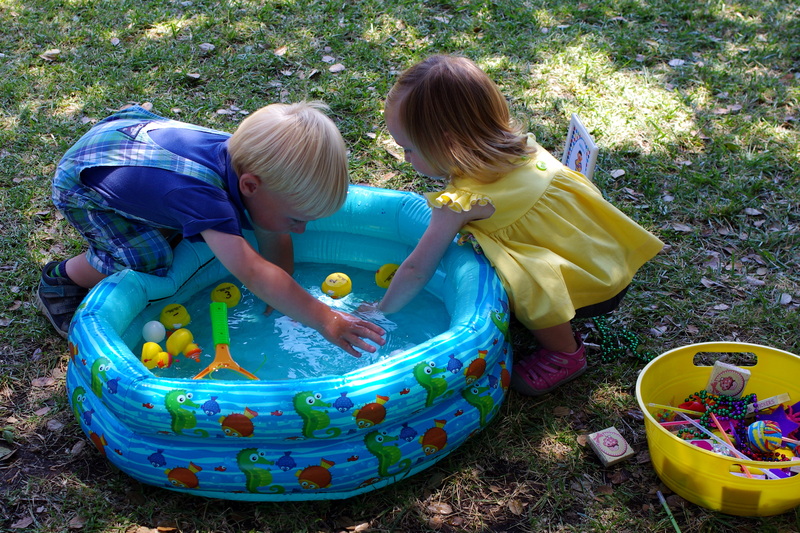 It was a day of good friends, good food, and a refreshing swim in the church pool. 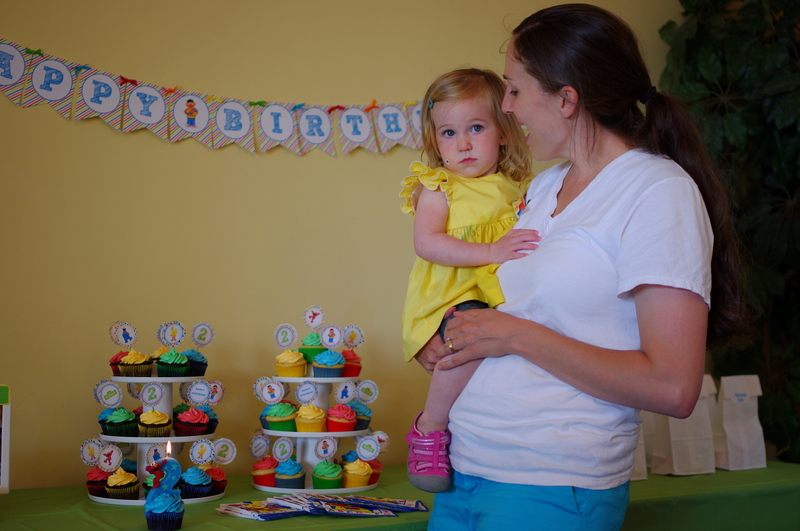 I can’t believe I planned my first birthday party and lived to tell the tale! 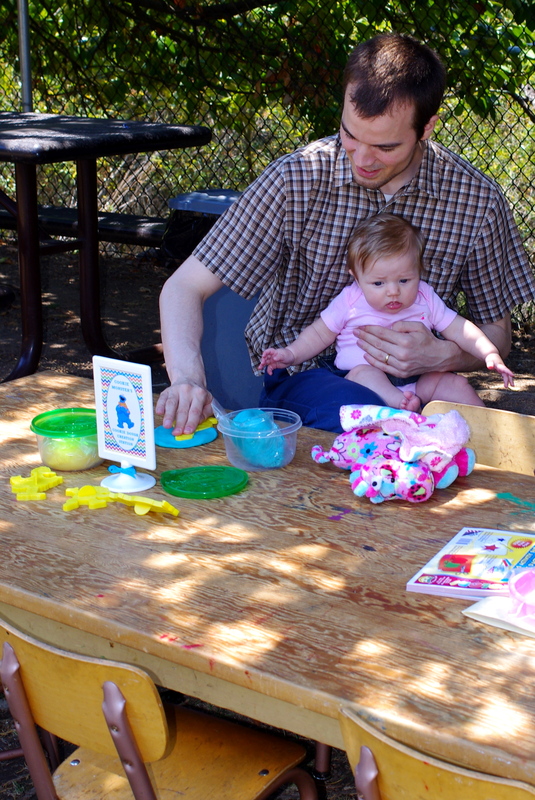 It was so much more work than I thought it would be, and what I did was incredibly simple compared to the so many talented mommies out there in the blogosphere. I’m proud of what I put together, though, since party planning is really not my thing. Although I had grand plans to make the cake and cupcakes from scratch, I ended up using cake mix. Thank goodness too, because even that took forever. For the cupcakes I used a yellow cake mix—I’m not a big fan of vanilla—and a chocolate fudge cake mix. And for the cake I used chocolate fudge mix also. The trouble I ran into with the cake mix was that it’s so light that I had a heck of a time moving the cake layers from the pans, to the cooling racks, and then onto the cake plate in one piece. Oh well, nothing that a little frosting couldn’t hide. And speaking of frosting, I did actually make my own. It was delicious! Not sickeningly sweet like so many recipes out there but definitely sweet enough to satisfy the sweet tooths in this house. 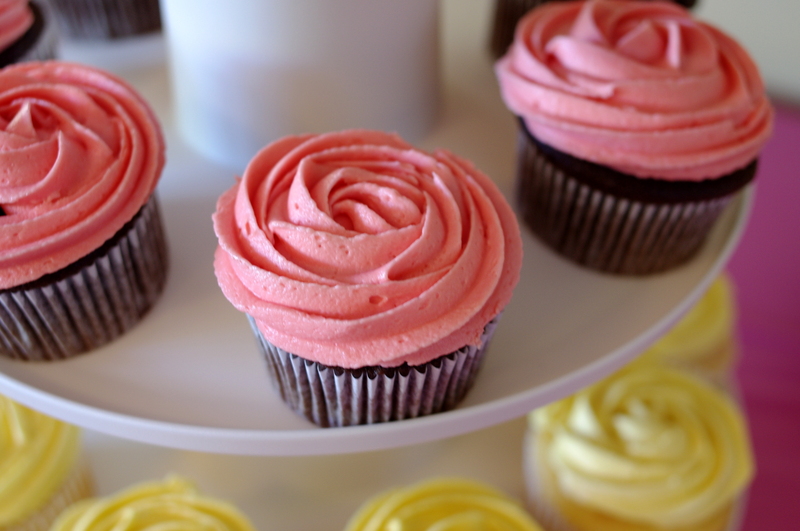 I used this recipe and this tutorial with my 1M frosting tip to get the rose effect. It was my first time ever piping frosting and I never had a mess up. Super easy and quick! My only complaint was that I put too much red dye in my batch of pink frosting for the cupcakes and it turned out more coral than pink. At least I got the cake frosting right. For the table layout, I used two desert towers from Joann’s to display the cupcakes. I didn’t really love the way the yellow and chocolate cupcakes looked side by side but this dilemma was unavoidable since I wanted people to be able to choose from two kinds of cupcakes. 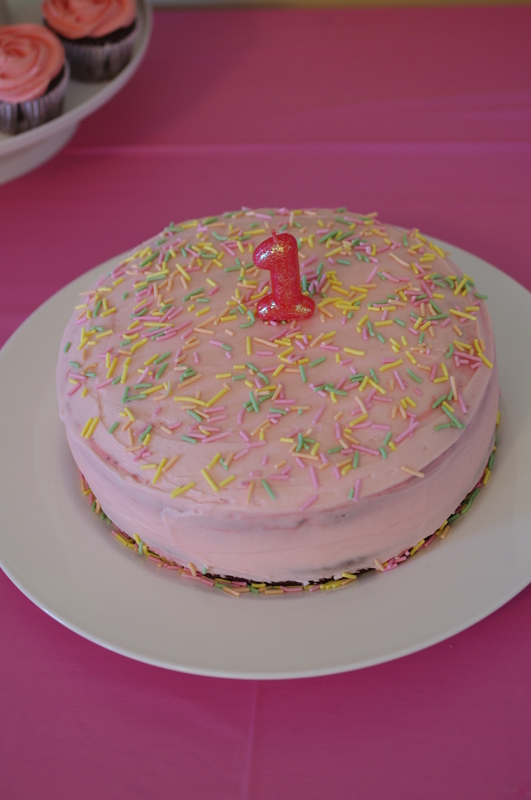 The cake was was just a simple two layer cake with frosting, sprinkles, and a target candle. The pictures were Hannah’s birth announcement and her 1 year announcement/invitation. How I love those Costco photo cards! 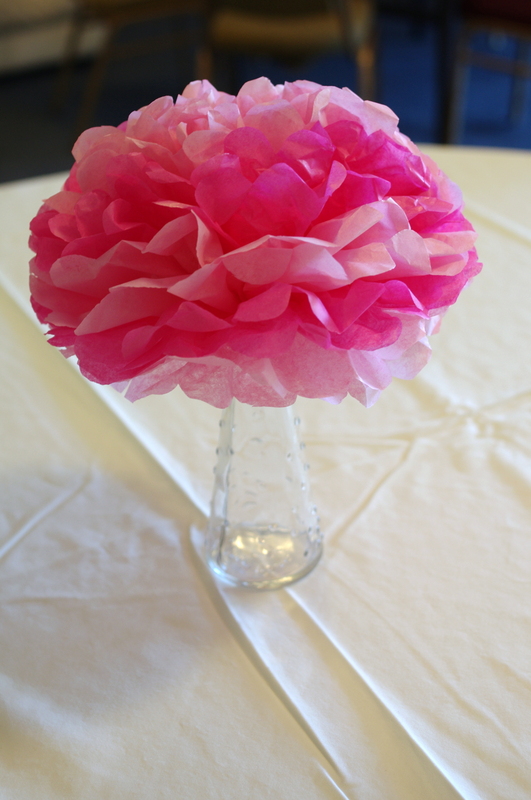 And lastly, one of the table centerpieces, a tissue pom flower, so that the centerpieces on the tables would match the birthday table. 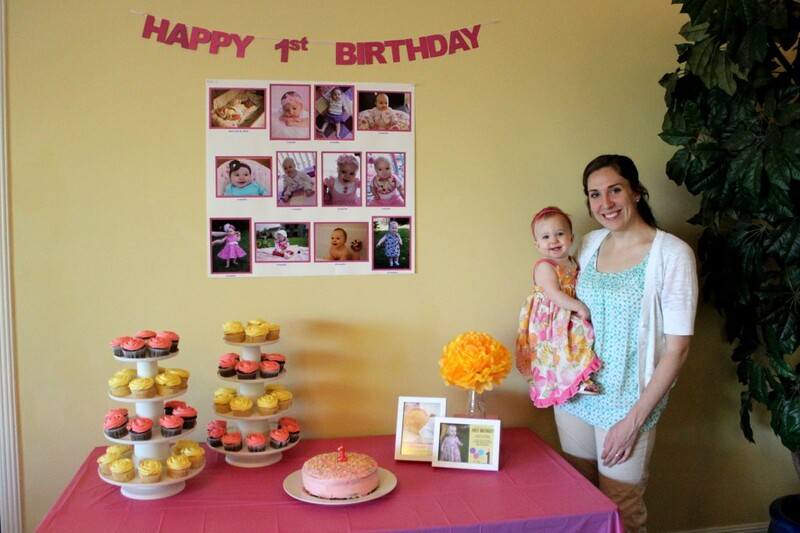 Hanging above the birthday table was a collage of Hannah’s first year month by month. I mounted 5×7 prints on scrapbook paper with double sided tape and then glued them onto posterboard. To make the garland, I traced and cut letters from my scrapbook paper scraps and glued them to a long piece of ribbon. For the tables I made really simple but somewhat time consuming tissue poms. There are a bazillion tutorials out there, but I came across this video on youtube, which was pretty straightforward and easy to follow. The vases were 79 cents at Ikea! 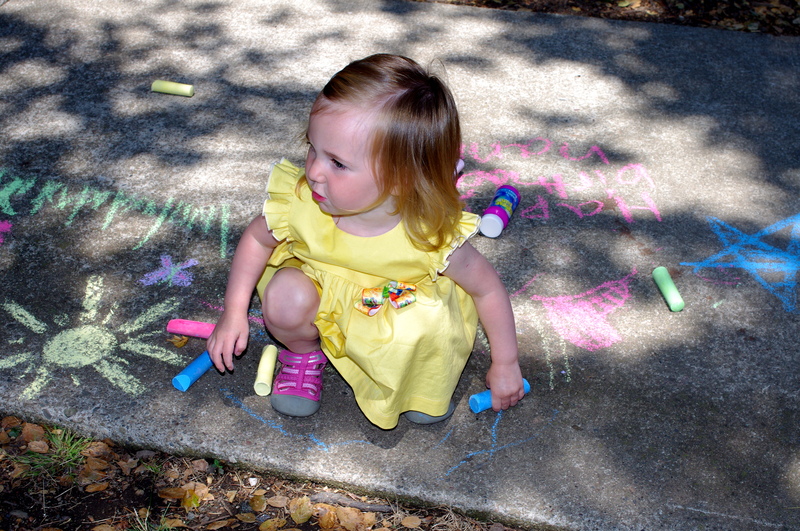 I didn’t really have a super cohesive theme, but I was sort of going for pink and yellow floral to match Hannah’s dress. Overall I’m pretty pleased with how things turned out. There were a few bumps in the road along the way but I’m just glad that I got everything done and that we had a lot of fun celebrating Hannah’s first year!